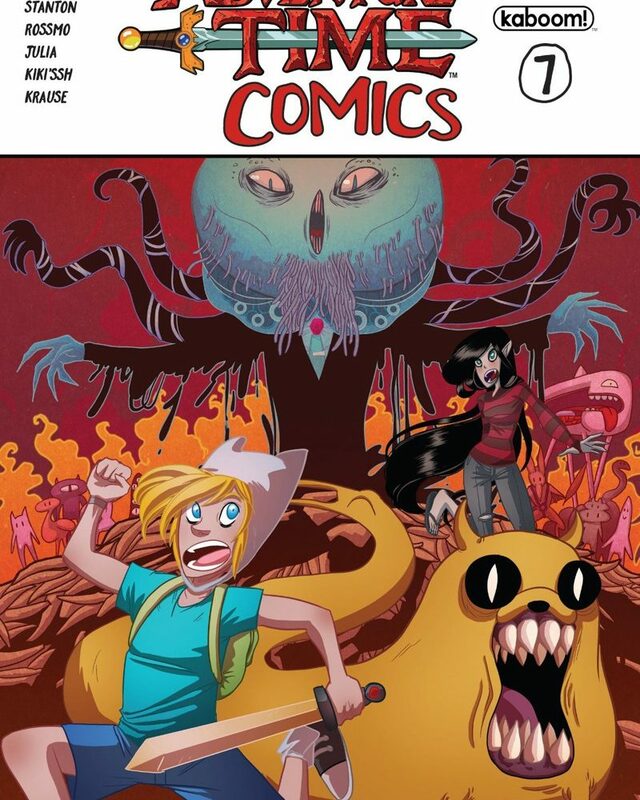 This Adventure Time Issue brings us five short stories, Gunter recites a tale about true heroes. Jake is having some dietary issues and Finn must do a thorough examination. Marceline teams up with Bubblegum Princess to investigate a case of supernatural hauntings within her castle. Choose Goose goes on a quest in search of a new pair of kicks. And finally, one elephant’s tale of seeking an experience that is life changing. It has been some time since I reviewed an Adventure Time piece. This mini collection houses four short tales, allowing the Marceline and Bubblegum piece to be the most expanded upon. 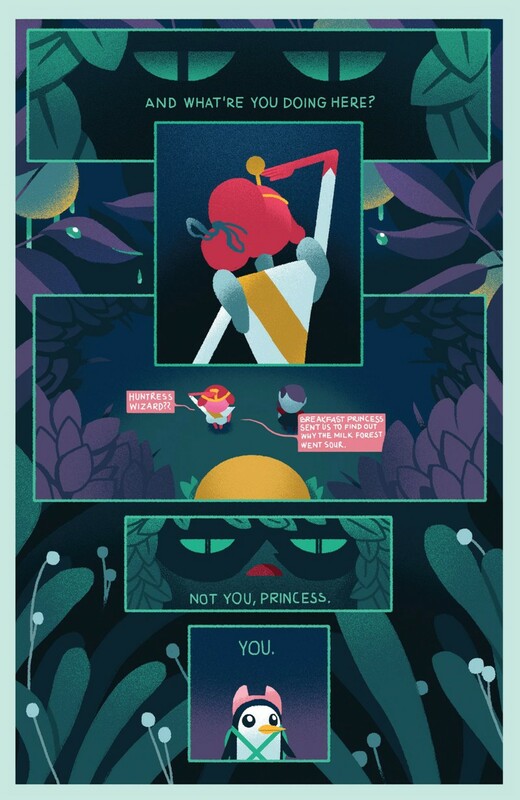 Adventure Time is known to be quite a humorous show but it can also provide some deep thought provoking dialogue, the last story in this issue in particular. With tales as short as these, the jokes and drama must be executed with precision, with no delay due to the small number of panels. I find that you must be in a certain mood to read these, as they require an alert mind in order to fully appreciate the work. This issue begins with an adventure with Bubblegum and Marceline, as they journey through the Milk Forest in search of why its’ milk has turned sour. A sentence I never imagined I would ever write, but that makes this all the more interesting. These two girls will not be the heroes of the story, but the compassionate and feline equipped Gunter will save the day. Finn takes on a biological mission, to explore the depths of Jake’s digestive track. However it turns out Jake’s’ innards would make a great open house with beautiful surroundings. Marceline and Princess B explore the Castle in search of the poltergeist terrorizing the candy people. However when the ghost fails to accept the truth, the only option is to dispose of the unwelcomed guest. The BFF’s gear up in their Ghostbuster gear to tackle this phantom pest. All of these stories have some element of adventure in them, making them fun to read and share. They are also perfect to pick up and re-read all over again, like a classic Beano magazine. With a total of five stories, all of which have been both written and illustrated by the same person. Kevin Jay Stanton created “Gunter The Hero”, whose artstyle is very colorful and would remind me of a linoprint. “Better Diet” is by Riley Rossmo and is exactly what I would expect from the show. Crazy illustrations that just bring the characters to life. All with so much going on in just the one page. “Spring Cleaning” was developed by Marina Julia, giving us a look into the close relationship the two leading girls have. The artwork is good, with everything from the characters to background items being given detail, whilst still being crisp and clear. The story was the most humorous in my opinion as I highly enjoy these two characters in the show. “Sick Kicks” was produced by Kiki’ssh, where Choose Goose goes on a lengthy journey in order to do an important swap exchange. Along the way he even swaps an item with what I understand is Link from Zelda. A nice crossover reference if my instincts are correct. Some interesting illustrations, with the Cursed Kings’ decaying state being the most eye catching for me. While “I’m Lost” is brought to us by Fran Krause, all printed in a pink hue with little illustrations on the surroundings, it allows the script to take more focus. Issue 7 can be found with the cover image above by Eva Cabrera. Although the cover has no connection with the stories inside, a trait I find to be a real annoyance. We see a more realistic image of Finn and Marceline. As Finn and Jake make a quick getaway from the depths of Hell. Marceline looks to be standing in front of an angered Jellyfish looking demon. I have no clue as to what the story is behind this piece as it is not to be found in this Issue. Overall an okay issue, good for a short read. 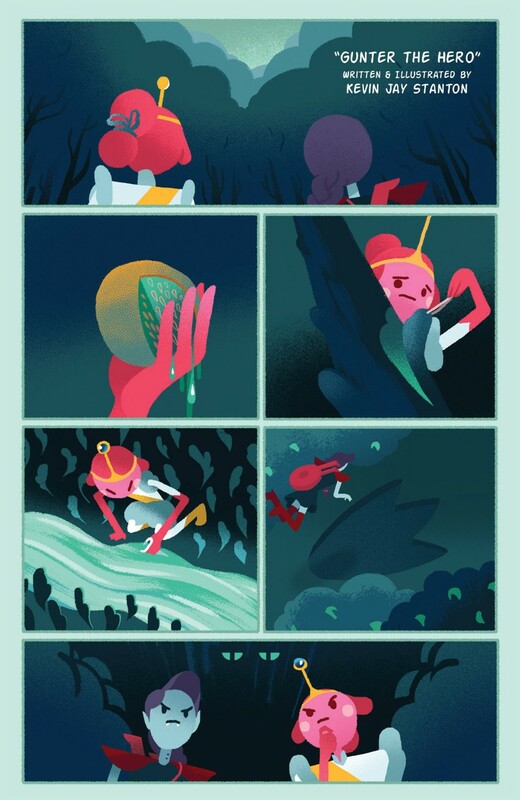 I prefer multi-issue stories but Marceline & Princess Bubblegum’s adventures were a treat.